I first visited this place before it hit DDD and Man vs Food. I found it on the chowhound.com board which is one of my go-to places when I start researching a city. It’s located in what seems to an Asia-town area just west of the strip around a 10 minutes car ride away. Let me warn you though, this is not first date food, nor is it something you want to have if you plan on going out to the bar later that night. What it is though is downright get your hands dirty delicious. I love how everything is served in plastic bags and you just ate over a plastic tablecloth. I’m not really in to getting messy while eating, but for something as amazing as this, I’ll do it. We didn’t waste our time with any appetizers or extras, we were just there for the seafood. 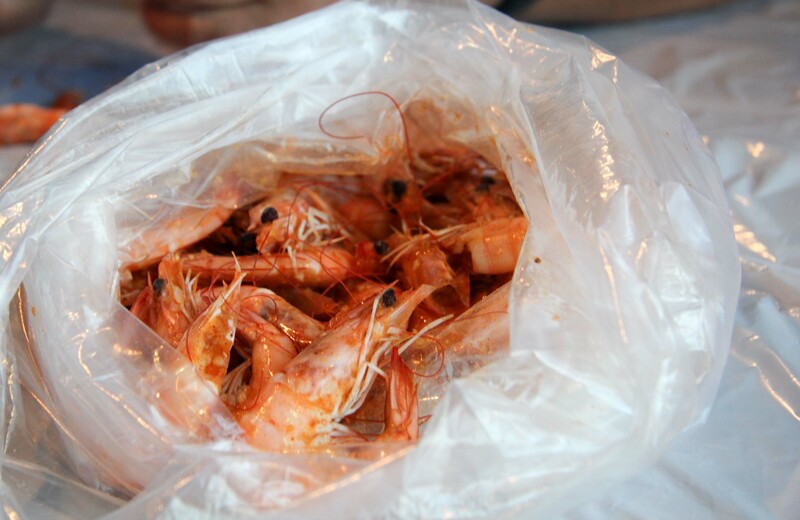 There are a variety of seasonings that you can have with your seafood ranging from garlic butter, lemon pepper and cajun. We chose the mild hot n juicy special seeing as it was just a combination of all the sauces together. Our server guided us well, because mild ended up kicking off enough heat and I was able to control some extra spiciness with a side of hot sauce on the side. We ordered a pound of prawns, crawfish and king crab. I really wanted the dungeness crab, but that wasn’t in season. We weren’t going to bother with the crawfish because it’s so finicky to eat, but seeing as the place is called Hot N Juicy Crawfish I felt like we had to get some. These delicious prawns were my favorite of the 3, although I think the crab won out with the others. 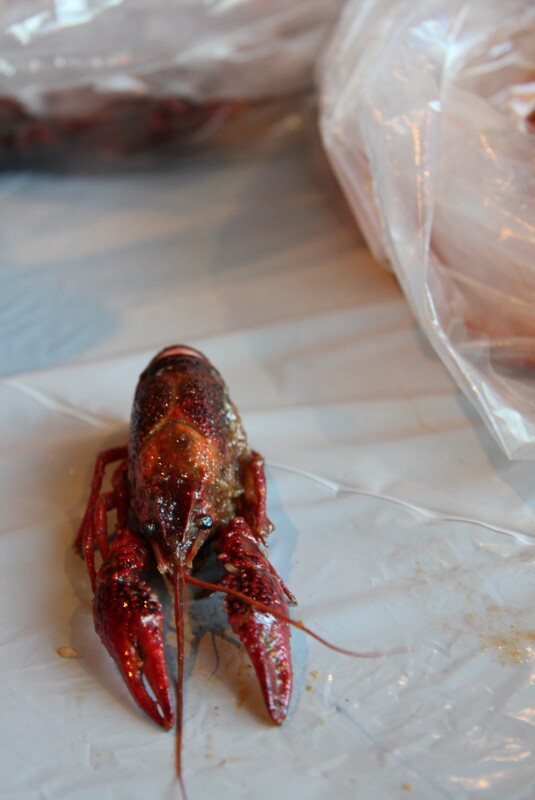 I left feeling that we didn’t have to order the crawfish, but I’m sure the next time I go back I’d order them again! I don’t have a photo of the crab. By the time it came out, my hands were so dirty I didn’t want to pick up my camera anymore. For your reference though, we got 2 King crab legs in a pound. We ended up ordering a pound more of the shrimp and crab which filled us up. A meal without starch or vegetables is a rarity for me, but neither was missed! I’m adding one non-food related photo to end this post. Here’s a shot I took outside the hotel tonight that I’m somewhat happy with. Setting my camera up on a wall I was able to get a clear 1 second exposure for this one. Wow – pretty cool. I’m pretty hungry now having looked at the photos. Hot N Juicy Crawfish looks pretty cool – I’m heading to Vegas in three weeks – is it worth checking out with 5 guys (some of whom have limited budgets)? Is it relatively accessible from the strip? 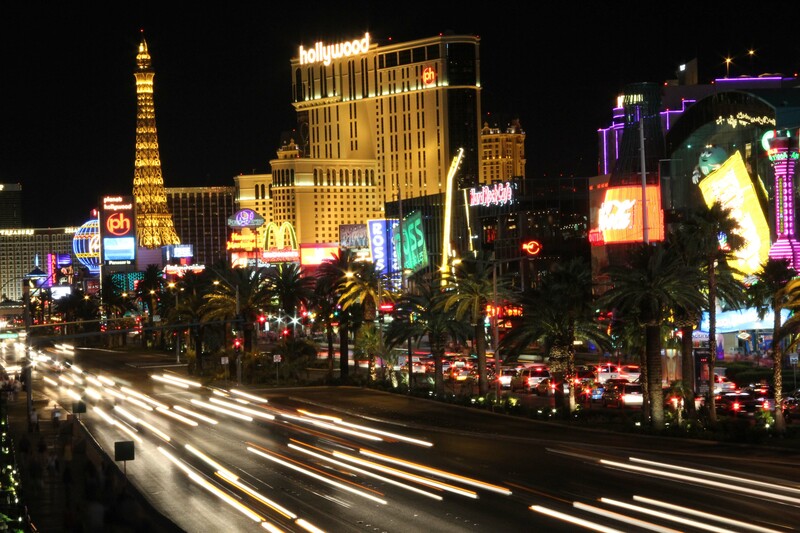 It was about a 10-15 minute drive from the MGM, closer if you’re on the north end of the strip. You’d have to cab there, and I’m not sure how much that would cost. For the 5 assorted pounds of seafood& 4 pops it was $90. That fed the 4 of us, and we didn’t get any fillers(fries, potatoes rice). It’s get your hands dirty eating and the atmosphere is casual. And thanks for reading Ken! When are you going? Where are you staying? Might be able to think of some good recs for you. I think we’re staying at the MGM – a 15 minute drive isn’t too bad for a fun, messy experience! We stayed at the MGM. You should try to check out the Happy Hour between 5:30-7:30 at Seablue. $1oysters &shrimp and $7 lobster corn dogs. We never got there, but have heard good things about it.